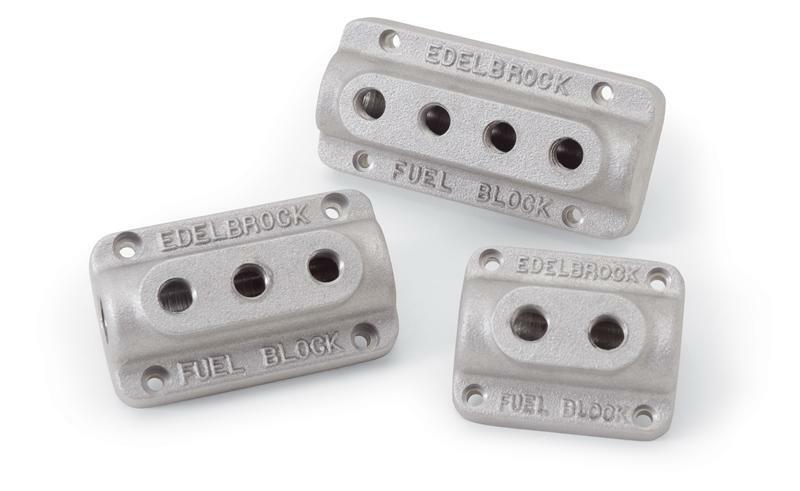 Edelbrock has reintroduced the vintage cast aluminum fuel blocks for dual, triple and quad carb applications for your hot rod or custom applications. These fuel blocks feature a single 3/8” inlet and one, two or four 1/4” outlet, depending on application. Each fuel block has four holes for mounting to a firewall. Available satin or with polished finish. These Fuel Log kits are exact replicas of the original designs used by Vic Sr. in the 1950’s. They are made from extruded aluminum tube with a 3/8” threaded outlet at each end and a polished finish. Kit includes, black neoprene hose, Corbin self-tightening clamps, barb fittings, 3/8” pipe plug and a period-correct Edelbrock decal for the right look. Dual-quad kit #1283 can be used with Edelbrock 94, Performer and Thunder AVS applications. Triple deuce kits #1284 and #1288 are for use with Edelbrock 94 and similar applications. Finally, kit #1287 is intended for use with the Edelbrock Ram Log intake manifold or similar six carburetor application. The Edelbrock Mini Fuel Block was first introduced in the late 50’s as a great way to manage fuel distribution for your dual or triple carb applications. Now it’s back – joining the other classic Edelbrock fuel blocks. All of them are a great way to finish off your Edelbrock 94 carburetor and intake manifold installation! * Includes the block, fittings, fuel hose, and clamps.